As a business owner for over 19 years, Ken Zuromski understands the importance of providing a quality product and this is what originally attracted him to Garage Experts. Having been involved in the modular building industry for over 30 years, Ken has become an expert in designing and manufacturing solutions for modular spaces. As an avid “do-it-yourselfer”, Ken has spent weekends actually designing and installing his own garage flooring and garage storage cabinets with products purchased at local home improvement stores. While some products proved to withstand their claims, others did not. After putting a lot of time and effort into this endeavor, he realized that not everyone has the time, experience or knowledge to make their garage into functional space. Looking for new entrepreneurial opportunities, Ken came upon Garage Experts, and was immediately interested in pursuing this further. By combining his experience and knowledge of construction, along with his expertise in designing usable space, Ken knew that Garage Experts would enable him to pursue his passion. Carl Gutberlet retired from a command staff position at the Baltimore City Police Department, and went on to serve in other leadership roles within the public security industry. He has spent his career leading personnel teams and has come to understand the importance of personal relationships. 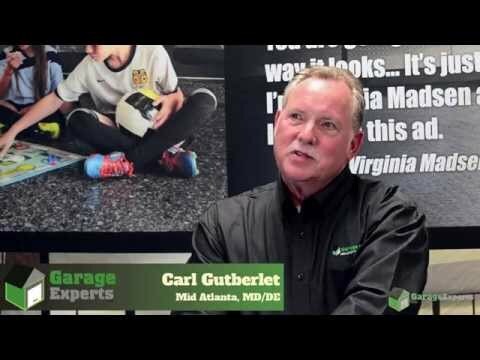 Recognizing his leadership and interpersonal abilities, Carl felt that Garage Experts would be the perfect opportunity to work with the public and to explore the challenges of being an entrepreneur. As a public servant, Carl came to value the importance of listening and actually understanding the needs of your audience. Leveraging these skills, Carl looks forward to working with Garage Expert clients to help them meet their storage solution and garage makeover needs. As a provider of custom garage storage systems, and epoxy flooring, Garage Experts not only serves residential customers, they can also design custom cabinets and install epoxy floor coating for industrial and commercial clients including automotive, retail, medical, and education, to name a few. Through personalized meetings, Garage Experts has the ability to truly understand their clients to deliver a solution that exceeds their expectations. MidAtlantic Garage Experts hold a home improvement license in Maryland (#MHIC131266) and a contractor’s license in Delaware (#2013104491). Platinum badges are issued to those locations that rank highly in number of installations completed with high customer satisfaction. These locations represent the best 20% of GarageExperts locations, and the best of the best when it comes to quality garage renovations. When you’r;re choosing a Platinum GarageExperts location, you’r;re getting excellent service, support and products throughout your garage renovation. GarageExperts of Mid Atlantic is your local garage makeover expert. View some of our recent work.